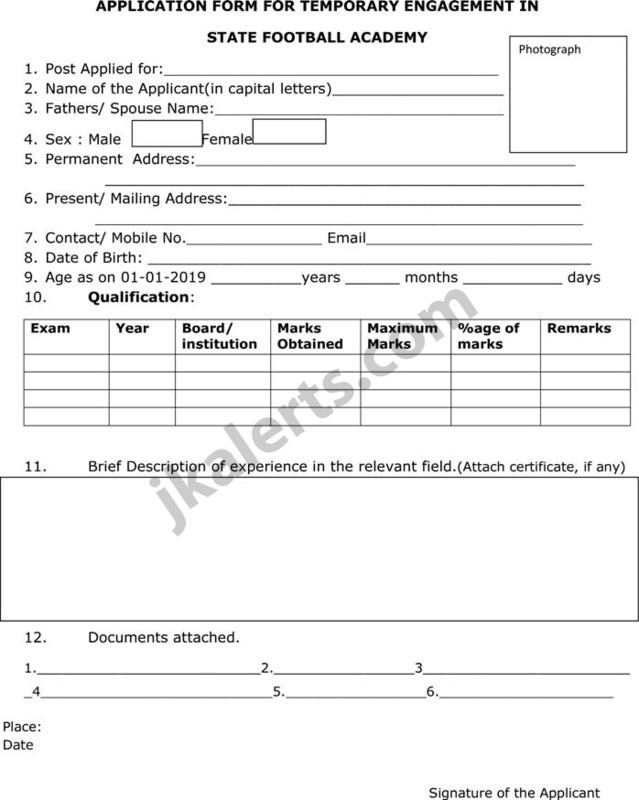 J&K State Sports Council Jobs Recruitment 2019.Walk in Interview for Football Coaches/Instructor/Trainers, Physiotherapists, Sports- Attendants on temporary honorary basis. The application forms duly completed in all respects along with Xerox copies of all self-attested relevant testimonials affixed with two passports size photographs addressed to Executive Officer, State Football Academy, J&K State Sports Council, TRC Synthetic Turf Football Stadium, Srinagar or Administrative Officer, J&K State Sports Council, Sports House MA Stadium Jammu should reach in person or through registered/speed post by or before 15-03-2019 upto 4:00P.M. Last Date 15-03-2019 upto 4:00P.M. J&K Govt jobs in various Govt Higher Secondary Schools. Central University of Kashmir CUK Recruitment 2019. 1. The Coaches and Physiotherapists shall be paid an honorarium of RS.15000/- per month and Sports Attendants shall be paid Rs 5000/- per month. 2. Preference shall be given to candidates with additional qualifications and outstanding merit in Footballor fulfilling the prescribed criteria. 3. The selected candidates will be posted anywhere in the state. 4. All the engagements are temporary and initially for a period of one season. 5. The age as on 1st January, 2019 should be minimum 18 years and maximum of 65 years. 6. No TA/DAshall be paid for appearing in the interview/written test. 7. Application form should be completed in all respects. Incomplete application forms shall be outrightly rejected. 8. The State Football Academy, J&K State Sports Council will not be responsible for any postal/courier delays after the cutoff date. 9. The committee comprising of Chief Sports Officer, Sports Officer (K) (J) (C), Executive Officer Football and Head Coach Sports Council shall scrutinise the applications for the recruitment.